Delta County is a county located inthe northeastern part of the great State of Texas. As of the 2010 census, its population was 5,231. It is named for its triangular shape, much like the Greek letter delta. Two forks of the Sulphur River form its northern and southern boundaries, and meet at its easternmost point. Delta County is one of 19 prohibition, or entirely dry, counties in the state of Texas. Its seat and largest city is Cooper. It was founded in 1870. 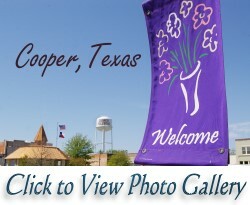 The county seat of Delta County is Cooper, Texas. Nearby, visitors will find Cooper Lake and recreational area, ample hunting, fishing, and exploration destinations. This is the first displaying of the new web site. It is very much a work in progress. The included pages allow departments to see what is here, and to suggest content for their pages. Additional Content can be expected soon. The web designer will rely on input and content suggestions from Delta County Officials, and staff and will be posted as available.